Nurses from Delmar Private Hospital. Nurses at Macquarie Private Hospitals voted ‘yes’ to industrial action – a historic first for the private hospital sector.Nurses at private hospitals owned and operated by Macquarie Hospital Services are poised to take protected industrial action to achieve a fair pay offer. Nurses at Minchinbury Community Private Hospital (Mount Druitt), Delmar Private Hospital (Dee Why), Manly Waters Private Hospital (Manly), Eastern Suburbs Private Hospital (Randwick) and President Private (Kirrawee), voted overwhelmingly to take industrial action. Action was being planned as The Lamp went to print. 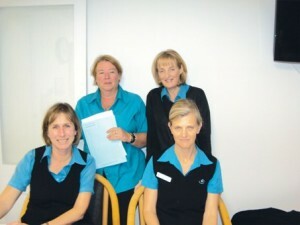 The ballot for industrial action was the first ever conducted by NSW private hospital nurses. Macquarie nurses were driven to take this historic action after 19 months of protracted and frustrating negotiations with their employer to improve substandard pay and conditions. Macquarie nurses are currently covered by the Nurses Award 2010 and most have not had a payrise in two years. Wages are dragging 12% behind public health sector wages and up to 12% behind other private hospital sector wages. For example, a Registered Nurse with eight or more years experience working at Macquarie receives $7,700 a year less than an equivalent nurse working in the public health system. Macquarie members and the NSWNA have been attempting to negotiate Enterprise Agreements with Dr Tom Wenkart, who owns Delmar, Manly Waters, Minchinbury and Eastern Suburbs Private Hospitals, and Dr Wenkart and Dr Landa, co-owners of President Private Hospital. According to Assistant General Secretary Judith Kiejda, the negotiations have been long and difficult, culminating in March this year when the employer made a grossly substandard offer. When the NSWNA advised that this offer was insufficient the employer commenced approaching nurses individually, asking them to sign Individual Flexibility Agreements that only offered a 2.5% salary increase and rolled some allowances (the uniform and laundry allowance and annual leave loading) into the base rates of pay. Not surprisingly, most staff declined the offer. Nurses at Macquarie Private Hospitals are concerned about being identified due to the tense negotiations. However, a spokesperson on behalf of nurses at Delmar Private Hospital said they felt as though they were being taken for granted. ‘We run the hospital 24-hours a day and we’re not being rewarded. We’re not being given the same money as other private hospital nurses and we’re doing exactly the same work as they are and we’ve got years of experience under our belts. All we want is to achieve parity – pay parity and the same conditions as nurses at other private hospitals. ‘We have been offered Individual Flexibility Agreements but they allow the employer to undermine any collective agreement. It’s easy to fob off just one person, rather than if we’re all united as a group. A union collective agreement is the best chance for a decent pay rise and conditions that allow us to balance our work and family life,’ said a nurse at Delmar Private Hospital. After discussion with members, the NSWNA applied to Fair Work Australia for orders for nurses to vote on taking protected industrial action. The orders were granted and nurses voted in favour of industrial action in June. Judith Kiejda said the strong vote in favour of industrial action at each facility was an indication of the strength of feeling among nurses. ‘The vote was unanimous at Minchinbury, Manly Waters, Eastern Suburbs, and President Private and 88% in favour at Delmar. The voter turnout was also unusually high at each hospital, with the lowest site having 82.75% of members voting. ‘Most private hospital operators seem to understand the need to remain competitive in terms of nurse wages and conditions. Once the rates paid across the state are known, most employers reach agreement with the NSWNA without the need for industrial action. Judith said Macquarie nurses wanted an Enterprise Agreement that brought their wages and conditions to the level received by other nurses in NSW, and they were prepared to take industrial action to achieve it. As The Lamp went to print, NSWNA meetings were being held at each facility to determine what type of industrial action would be taken at each hospital. In May, the NSWNA applied to Fair Work Australia (FWA) for orders for nurses at Minchinbury Community, Delmar, Manly Waters, Eastern Suburbs and President Private Hospitals to vote on taking protected industrial action. On 19 May, the FWA issued an order for the Australian Electoral Commission to conduct the ballot at all but President Private. Unlike the other four hospitals, President Private is only 50% owned by Macquarie Hospital Services. A delayed FWA order for President Private was made on 2 June. By 21 June nurses at all five hospitals had voted overwhelmingly in favour of a range of industrial actions involving strikes and bans in support of reaching agreement with their employer. The voting result means that nurses can now legally take industrial action after giving notice to their employer. indefinite or periodic bans on the after-hours administration of admissions (excluding palliative care).